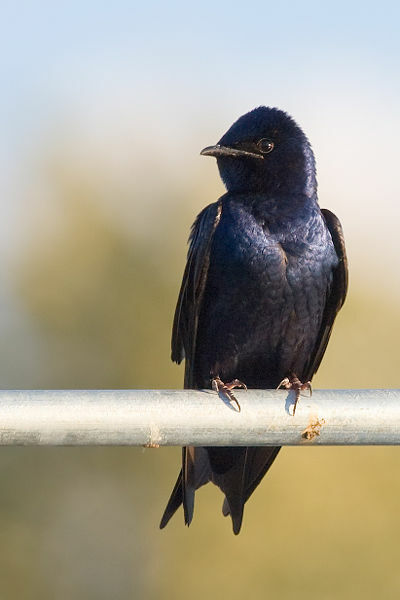 The Purple Martin and the Barn Swallow. CHAPTER 16. A Robber in the Old Orchard. 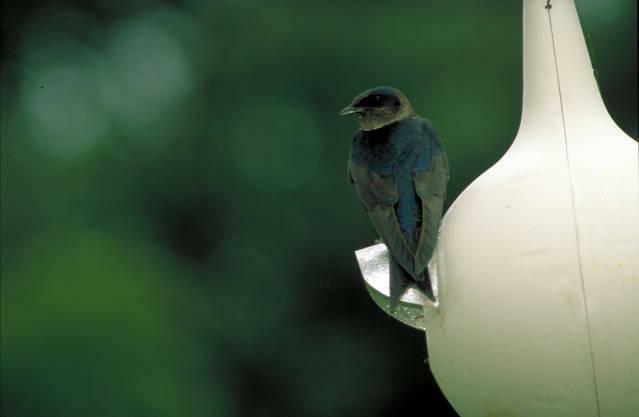 “What is it Jenny Wren has said that you don’t believe?” demanded Skimmer the Tree Swallow, as he once more settled himself in his doorway. 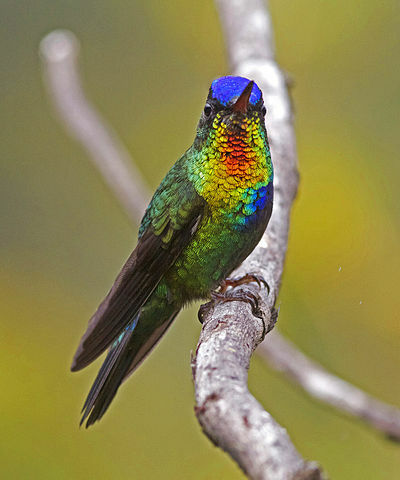 “She said that Hummer the Hummingbird is a sort of second cousin to Sooty the Chimney Swift,” replied Johnny Chuck. “How about me?” demanded a new voice, as a graceful form skimmed over Johnny Chuck’s head, and turning like a flash, came back. 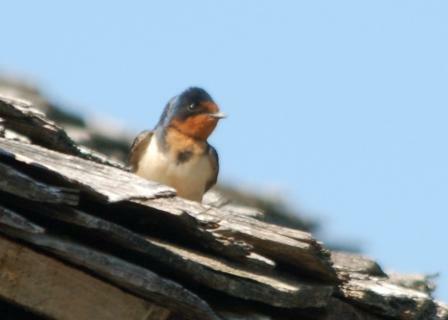 It was Forktail the Barn Swallow, the handsomest and one of the most graceful of all the Swallow family. He passed so close to Johnny that the latter had a splendid chance to see and admire his glistening steel-blue back and the beautiful chestnut-brown of his forehead and throat with its narrow black collar, and the brown to buff color of his under parts. But the thing that was most striking about him was his tail, which was so deeply forked as to seem almost like two tails. 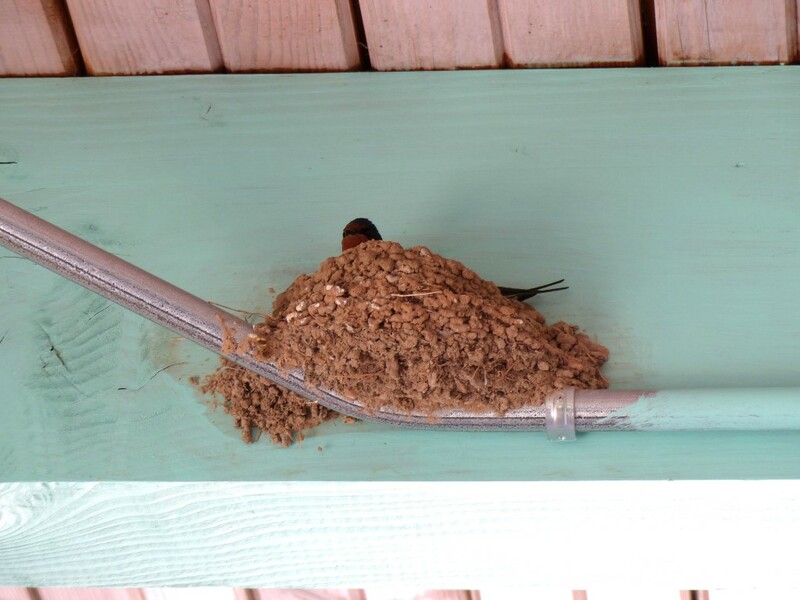 “That’s where he nests,” chuckled Skimmer. 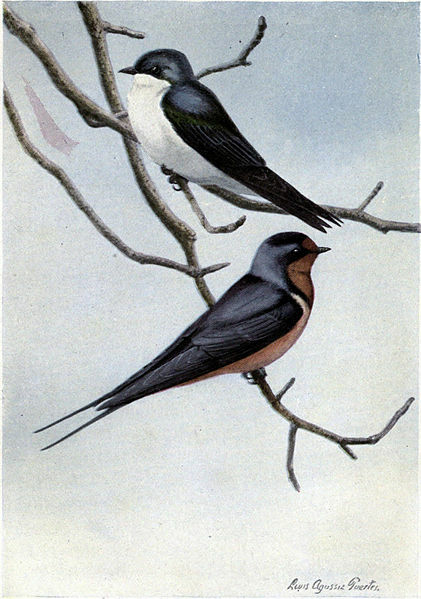 “Do you mean that such a neat-looking, handsome fellow as Forktail uses mud in his nest?” cried Johnny. But Johnny Chuck never knew what Skimmer was going to say next, for Skimmer happened at that instant to glance up. For an instant he sat motionless with horror, then with a shriek he darted out into the air. 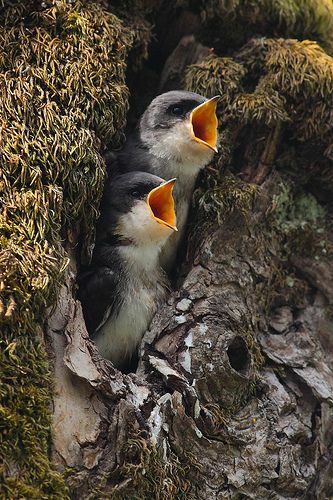 At the sound of that shriek Mrs. Skimmer, who all the time had been sitting on her eggs inside the hollow of the tree, darted out of her doorway, also shrieking. For a moment Johnny Chuck couldn’t imagine what could be the trouble. Then a slight rustling drew his eyes to a crotch in the tree a little above the doorway of Skimmer’s home. There, partly coiled around a branch, with head swaying to and fro, eyes glittering and forked tongue darting out and in, as he tried to look down into Skimmer’s nest, was Mr. Blacksnake. 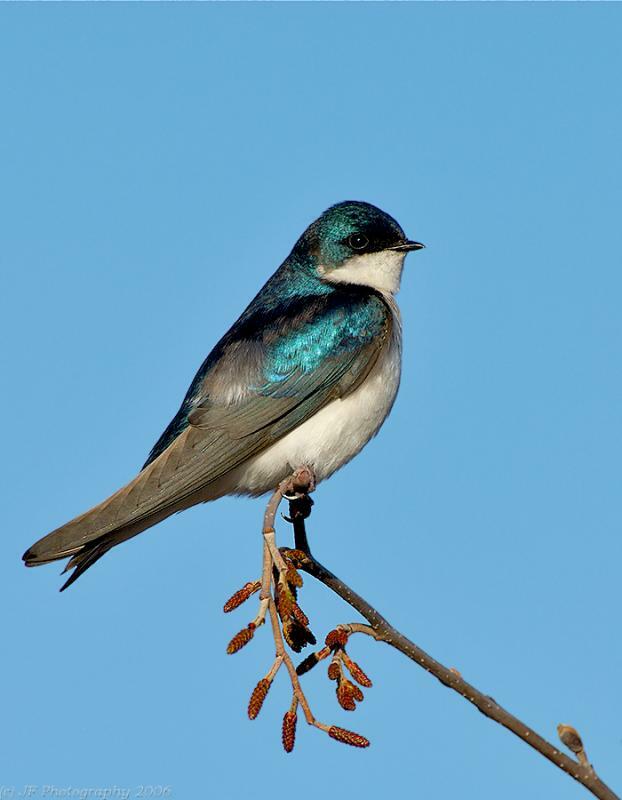 It seemed to Johnny as if in a minute every bird in the Old Orchard had arrived on the scene. 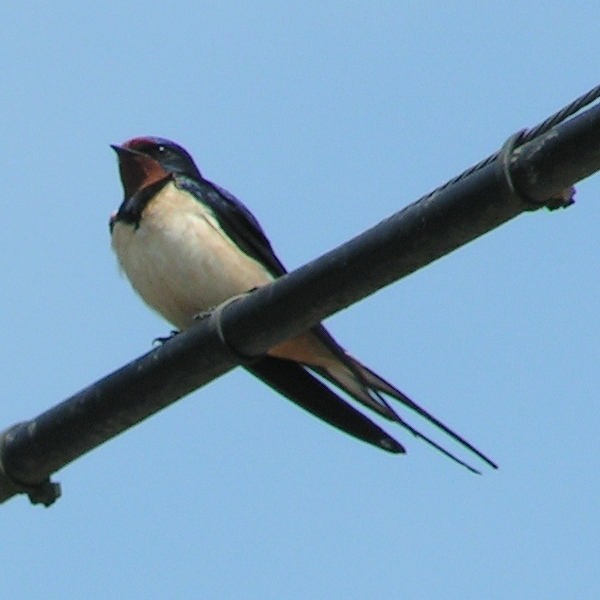 Such a shrieking and screaming as there was! First one and then another would dart at Mr. Blacksnake, only to lose courage at the last second and turn aside. Poor Skimmer and his little wife were frantic. They did their utmost to distract Mr. Blacksnake’s attention, darting almost into his very face and then away again before he could strike. 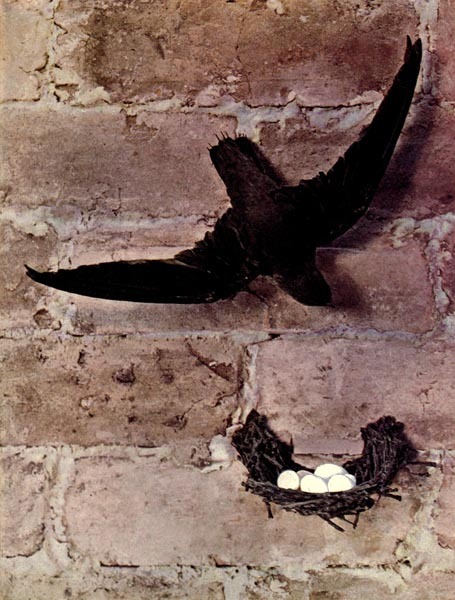 But Mr. Blacksnake knew that they were powerless to hurt him, and he knew that there were eggs in that nest. There is nothing he loves better than eggs unless it is a meal of baby birds. Beyond hissing angrily two or three times he paid no attention to Skimmer or his friends, but continued to creep nearer the entrance to that nest. At last he reached a position where he could put his head in the doorway. As he did so, Skimmer and Mrs. Skimmer each gave a little cry of hopelessness and despair. But no sooner had his head disappeared in the hole in the old apple-tree than Scrapper the Kingbird struck him savagely. Instantly Mr. Blacksnake withdrew his head, hissing fiercely, and struck savagely at the birds nearest him. Several times the same thing happened. No sooner would his head disappear in that hole than Scrapper or one or the other of Skimmer’s friends, braver than the rest, would dart in and peck at him viciously, and all the time all the birds were screaming as only excited feathered folk can. Johnny Chuck was quite as excited as his feathered friends, and so intent watching the hated black robber that he had eyes for nothing else. Suddenly he heard a step just behind him. He turned his head and then frantically dived head first down into his hole. He had looked right up into the eyes of Farmer Brown’s boy! “Ha, ha!” cried Farmer Brown’s boy, “I thought as much!” And with a long switch he struck Mr. Blacksnake just as the latter had put his head in that doorway, resolved to get those eggs this time. But when he felt that switch and heard the voice of Farmer Brown’s boy he changed his mind in a flash. He simply let go his hold on that tree and dropped. The instant he touched the ground he was off like a shot for the safety of the old stone wall, Farmer Brown’s boy after him. Farmer Brown’s boy didn’t intend to kill Mr. Blacksnake, but he did want to give him such a fright that he wouldn’t visit the Old Orchard again in a hurry, and this he quite succeeded in doing. 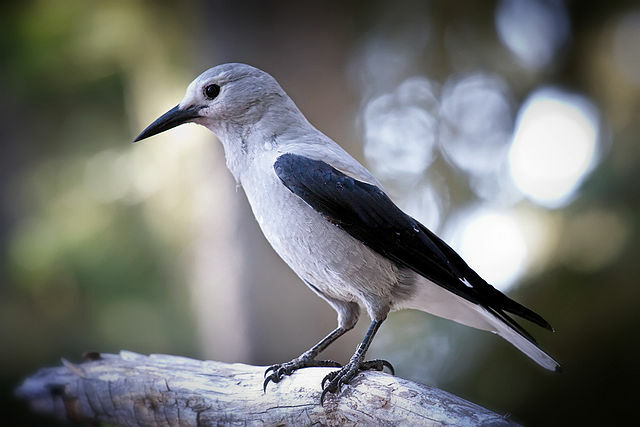 No sooner had Mr. Blacksnake disappeared than all the birds set up such a rejoicing that you would have thought they, and not Farmer Brown’s boy, had saved the eggs of Mr. and Mrs. Skimmer. Listening to them, Johnny Chuck just had to smile.